Bengaluru: Kerala Blasters will renew their rivalry with table-toppers Bengaluru FC when the two sides meet in an Indian Super League fixture at the Sree Kanteerava Stadium on Wednesday at 7:30 pm. The two sides have a burgeoning rivalry between them, and three points will be highly coveted despite the disparity in their positions on the table. Bengaluru had all but sealed their spot in the playoffs with 30 points from 13 games while Kerala Blasters are out of the running for the same (10 points from 14 games). "The reason we are on top of the league is the work that we have put in as a whole. We take risks, but we know that we are taking risks. The outcome is that we are on top of the league," Bengaluru head coach Carles Cuadrat said. Bengaluru FC will be boasted with a possible return of Miku, and the new signing midfielder Luisma Villa - adding more versatility to their attack. 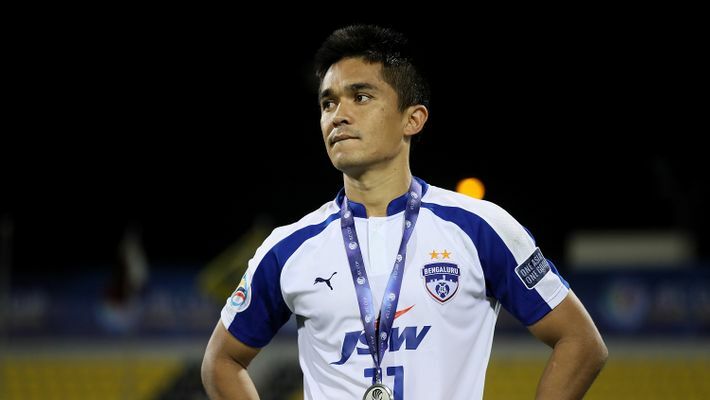 However, the long dry run of captain Sunil Chhetri, who hasn't found the back of net last 600 plus minutes, is a cause for concern for the league leaders. Cuadrat is likely to prefer Harmanjot Khabra at the full-back position over Rino Anto after the latter failed to impress against NorthEast United. While Nishu Kumar has begun training with the first team, it is unlikely that he would be handed a start. "I feel that the rivalry is great and the atmosphere in Kerala was really nice. Their supporters were really vocal during the game, and even though they lost, after the game they gave us a good reception," Caudrat said. It has been a forgettable season for the Blasters, who are on a winless streak in 13 matches. In January, David James was replaced by Nelo Vingada as the team's head coach. But, the Portuguese tactician has not fared that well either, succumbing to a draw and a loss in his first two games in charge. Kerala Blasters have been wasteful in converting chances. Off 139 opportunities created by Kerala this season, just 13 have been turned into goals. They also have the second worst defensive record with 23 goals leaked in. In defence, there is concern over Anas Edathodika's fitness and Sandesh Jhingan will need to marshall his troops well if Kerala is to notch their first ever win over Bengaluru FC. Full-back Lalruatthara will be forced to sit out the game due to his red card against Delhi Dynamos. "I only look at the next match. The next match is always the most important match. The past is done. I need to see what's wrong and try to get better in the next match. I hope that we can go up by one or two positions. Now we need to look at recovering the confidence," Kerala Blasters head coach Nelo Vingada said before the game. "With these players, we need to perform better, so I need to check what's wrong and get the best out of them," he added. Kerala might have only pride to play for, but the prospect of getting the better of a rival should be enough motivation for them. For Bengaluru, it will be about consolidating their supremacy atop the table.